Life with children is hectic. Make it easy on yourself and bring the whole family! More than one child? More than one option! Bring each child to his/her own class for some dedicated one-on-one. 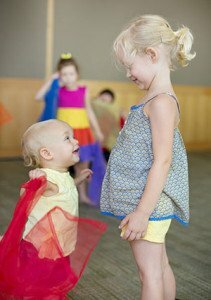 Choose a class for your older child and bring the younger sibling, too. Once the younger sibling is up and moving and participating (around 4-8 months), we’ll begin charging half price for the younger sibling. Until then, we’ll just charge you for the older child. Please contact us in advance so we can help you balance the needs of both children and make adjustments if it doesn’t work out. Bring the whole family! First child is full price, second child is 50% off, additional siblings 80% off. Please register each child individually for Mixed Age.